The economic malaise that has affected small and medium sized rust belt cities since 2000 has been widely noted. Most have seen little or no real household income growth since then. Much of the weak performance has been associated with the long-term decline of manufacturing employment in the region – a trend that is largely the result of increased productivity; imports have played a smaller role. But, even before 2000, incomes in rust belt metropolitan areas were weakening and employment growth had been slower than in other places. This post looks closely at the relationship between age, education and inflation adjusted personal wage income over the period from 1970 to 2015 to get a better understanding of the economic changes that have taken place during that period. The data shows that while income stagnation has been widespread, some age groups and educational levels have seen sharp declines in real income per capita since 1970 – nearly 50% in some cases. Younger workers and those without college educations have been hardest hit. The data for this post is from Public Use Microdata Samples made available by the U. S. Census Bureau. Public Use Microdata Sample files (PUMS) are a sample of the actual responses to the American Community Survey and the Decennial Census and include most population and housing characteristics. Because the data is from samples of households in metropolitan areas, sampling error is possible, particularly for smaller metropolitan areas. relatively little employment or earnings growth. Binghamton has been particularly hard hit. While all the metropolitan areas are in New York State, their recent economic performance differs relatively little from others in the region. Some, like the New York metropolitan area and the Albany-Schenectady-Troy metropolitan area had relatively high median household incomes compared to other areas in the region. Others, like most upstate metropolitan areas, had median incomes that were typical of the rust belt. Consequently, it is likely that other rust belt metropolitan areas performed similarly. The Census Bureau defines personal wage income as total pre-tax wage and salary income – that is, money received as an employee – for the previous year. Annual wage income includes the amount of wage income received by all people having wage income in a year, including those who worked full or part time, and those who worked only part of a year as well as those who worked all year. Inflation adjusted median wage incomes for most groups declined between 1970 and 2015 – in some cases, substantially. Younger people and people with lower levels of educational attainment saw bigger losses than older and highly educated people. On average in the six metropolitan areas, the real median wage income for people with a high school education or less declined by 38.3% between 1970 and 2015. In that age group, even college educated people saw significant declines – about 21%. The only group that did not see a decrease between 1970 and 2015 was workers between 50 and 64 who had a college degree or more. In general, however, having a college education reduced by more than half, the size of median income losses. Age was also strongly related to the decline in median wage income. Median incomes for workers aged 25-29 were at least 21% lower in 2015 than they were in 1970. Older age groups were less affected than younger people, with those in the 50-64 age group seeing relatively small median income losses. A comparison of the inflation adjusted median wage incomes of people with high school educations or less shows that younger people had much lower median incomes in 2015 than they did in 1970 in each metropolitan area studied. In Buffalo-Niagara Falls, the median for the 25-29 age group decreased from $35,000 $18,600 (47%). 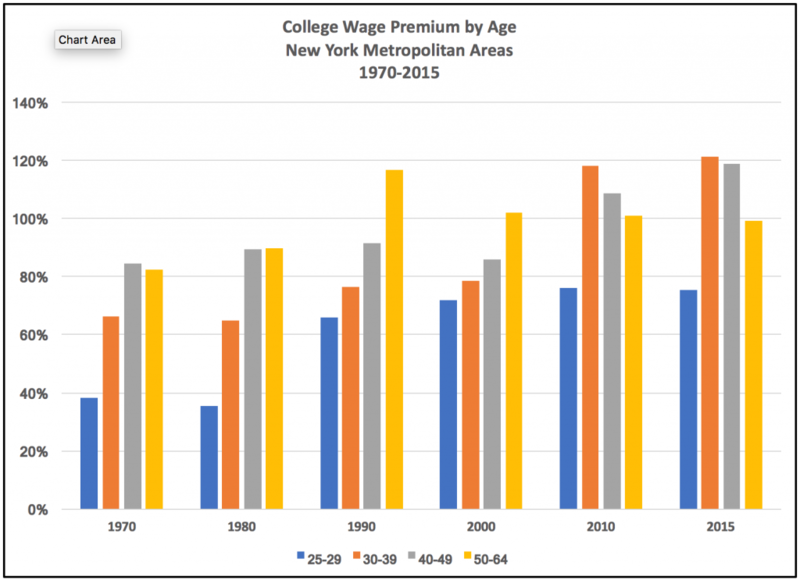 The median for 25-29 year olds decreased from $36,000 to $20,000 (44%) in the New York City Metropolitan area. In 2015, inflation adjusted median wage incomes for all age groups, with the exception of those aged 50-64, were 5% to 40% lower in each city than they were in 197o. 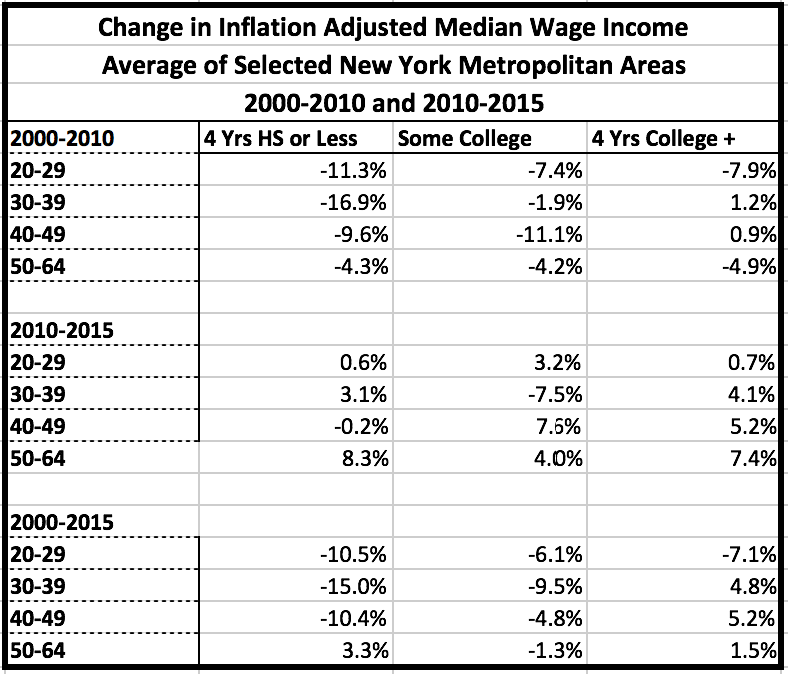 While the New York City and Albany-Schenectady-Troy metropolitan areas had greater employment growth and higher household incomes than most of their peers the declines in real wage income for people with four years or less of high school were not smaller than those in slower growing and less affluent places. For college educated people, the picture was better, though younger age groups saw real income decreases. With the exception of the Binghamton metropolitan area, people aged 25-29 with four years or more of college had median real wage incomes that decreased by 30% or less, with the exception of Binghamton. 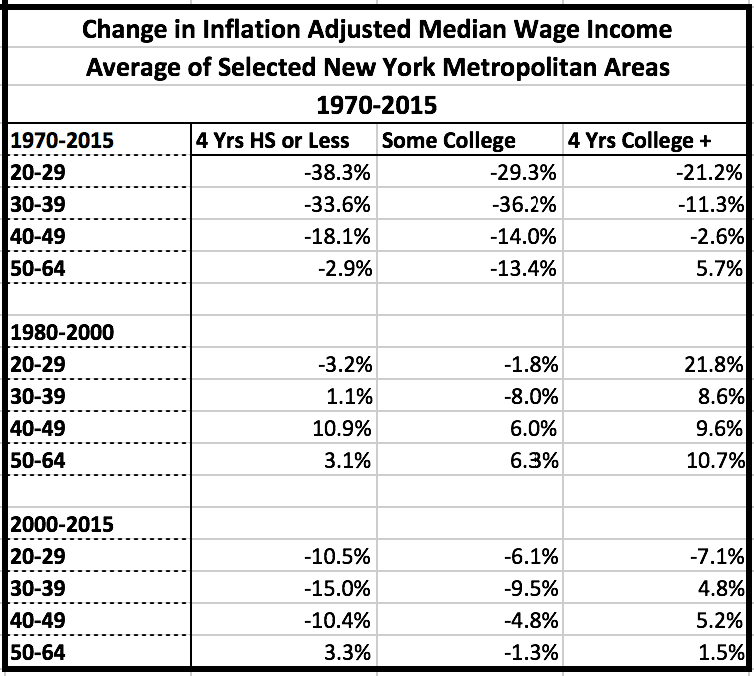 New York City metropolitan area inflation adjusted incomes were higher in 2015 than in 1970, with the exception of those aged 25-29. In other metropolitan areas, median personal incomes for most age groups were lower in 2015 than they were in 1970.The relatively strong performance of the New York metropolitan area may point to the relative strength of the labor market for people with four years of college or more there. 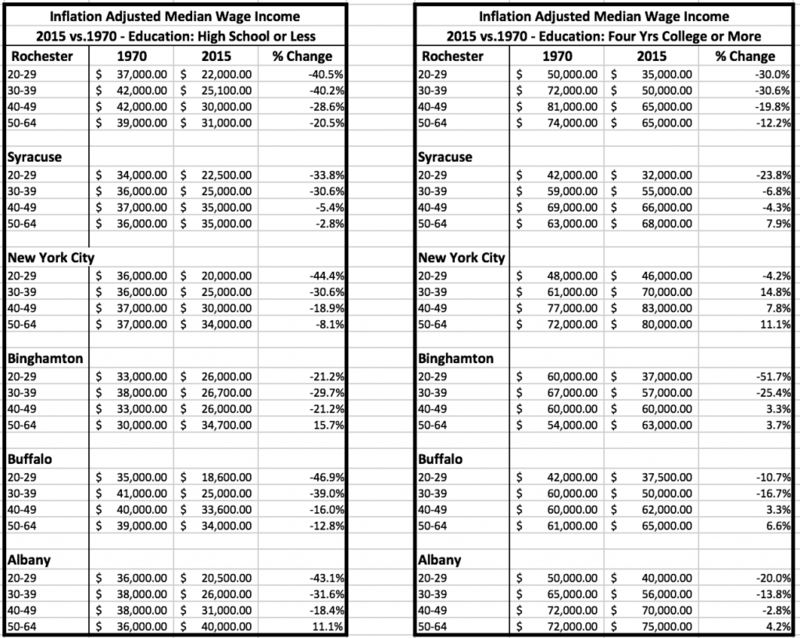 In contrast, the median income of people aged 25-29 with four years of college in Binghamton was $37,000 in 2015, compared with $60,000 in 1970, while in Rochester, the comparable decrease was from $50,000 to $35,000. Both areas saw employment at important businesses, like Kodak,Xerox and IBM, collapse or substantially decline between 1970 and 2015. The data shows that the period from 1970 to 1980 was the worst in the past 45 years for wage incomes. Non-college educated people aged 25-29 saw declines of more than 40% in that decade in the median real wage income in the metropolitan areas studied. Those with four or more years of college aged 25-29 had declines of more than 20%. Only workers with four or more years of college aged 50-64 did not see declines in real income during the period. The 1970’s were notable for large increases in energy prices, beginning with the Arab oil embargo, beginning in 1973. The resulting inflation overwhelmed nominal increases in wages for almost all workers. Between 1980 and 2000, most age and education groups saw some recovery from the 1970-1980 period. People with four or more years of college in all age groups saw the biggest largest increase in median real wage income. By 2000, medians largely recovered from the losses seen in the 1970’s. While median incomes for people with four years of education recovered slightly in most cases during the 1980 to 2000 period, the increases for people with high school educations or less fell far short of erasing the losses of the 1970’s. And, for the 29-29 year age group with high school or less education, median real incomes continued to decrease. increased by five percent or less. the 2008 recession, the labor market has tightened – unemployment is relatively low, though labor participation rates remain somewhat depressed compared to the past decades (Source – U. S. Bureau of Labor Statistics – Current Population Survey). Consequently, median wage incomes increased between 2010 and 2015. While the increases of the current decade trimmed the losses of 2000 to 2010, gains have been relatively small. The declines in median wage income in the past forty five years point to a number of problems in the labor market in rust belt areas. Much of the decline can be attributable to events that took place in the 1970’s related to increases in energy prices and economy-wide inflation. But, the decades following the 1970’s have seen uneven economic performance. The 1980’s and 1990’s saw some median wage income growth, but wage earners with high school educations or less did less well than those with four years of college or more. The 2000’s and 2010’s saw small gains for those with college educations, and significant losses for those with high school educations, or less. Government actions to increase aggregate labor demand would certainly benefit workers with all levels of education. Similarly, governmental actions to enhance the bargaining power of less educated workers in low skill jobs, such as higher minimum wage requirements, and easier union certification, would help. At the same time, the persistent gap in median incomes and income changes between workers with college educations and those with four years of high school or less demonstrates the continuing importance of good educational preparation. Despite the fact that the supply of college educated workers has increased substantially since 1970, the wage premium that they enjoy has increased, especially for worker in younger age groups. In 1970 and 1980, median wage incomes of workers under 30 with four or more years of college were less than 40% more than those with a high school education or less. In 2015, the difference was 76%. For most other age groups, median wage incomes for people with four years of college or more were more than double those of people with high school degrees or less. Given the durability of the income benefits of higher education, government policies aimed at increasing access to post-secondary education would be beneficial. For example, programs assisting groups that face barriers to higher education, such as economically disadvantaged children, could improve opportunities. Similarly, adults who do not have post-secondary training should be assisted in gaining access to college level studies. Median per capita income was computed for all cases showing income of more than $0. Income was adjusted for inflation by the Consumer Price Index for all Urban Workers and Clerical Workers. See: https://fred.stlouisfed.org/series/CWUR0000SA0. All values rounded to $1,000.